One of the many strengths of Pixar’s animators is their ability to turn creatures and objects into expressive, memorable characters. In Wall-E, the filmmakers have succeeded not only in bringing robot characters to life, but doing it with very little dialogue. 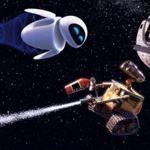 While Wall-E is more serious than its predecessors, it has just as much heart, and enough cartoon wackiness to keep viewers of all ages entertained. The movie is set in a future full of garbage. Humans have fled to the comfort of a space cruiser while Wall-E units (Waste Allocation Load Lifter, Earth-Class) are supposed to be cleaning up the mess. After 700 years, only one Wall-E is still operational. The title character is a metal box with caterpillar tracks for feet, and large binocular-shaped eyes that give him a soulful look. With his cockroach companion, he spends his days compacting trash and saving gnome figurines, rubber duckies and other objects that appeal to him. When he wants a little entertainment, he watches a VHS tape of Hello Dolly. The story gets into gear quickly when a rocket ship shows up, depositing a probe called Eve (Extraterrestrial Vegetation Evaluator). Eve is higher tech than Wall-E. Her sleek, white body flies with the greatest of ease. Despite her tendency to shoot first and investigate later, Wall-E is smitten. What follows is a charming wooing sequence, told mostly through images and sound effects. Wall-E shows off his marvelous collection of stuff (Eve is mightily impressed with his collection of lighters) while show tunes play in the background. It tells us all we need to know about that the characters are feeling for each other. No sooner has Wall-E won Eve over, when she finds what she was looking for on Earth and her programming kicks in. The action then shifts to the space cruiser Axiom, where the temperature is always 72, and morbidly obese humans spend their lives on floating recliners, monitors a few inches from their faces for constant entertainment, and robots to take care of all their consumer needs. With the robot romance still in progress, the movie starts to ponder the fate of humanity. It’s not really the humans’ fault that they’ve failed to live up to their potential. They just don’t know any better. A sequence of pictures of past captains of the Axiom tells us all we need to know about the effects of living in outer space on the human body. The current captain has an idea that there’s more to life than conspicuous consumption. That probe recently returned from Earth and her plucky little friend just might give him the impetus shake things up. The movie has plenty to say about the dangers of complacency and the importance of self sufficiency, not to mention the problems created by generating so much trash. (Which may lead one to wonder about how much packaging will be used for all of the Wall-E merchandise.) Refreshingly, the movie has no true villain. Humans created the mess, but they also have the potential to fix things. Contained within the story, the messages never feels preachy. Between the cheerful anarchy of robots running amok on the spaceship and the outer space dance of two robots in love, Wall-E has plenty for audiences to enjoy.